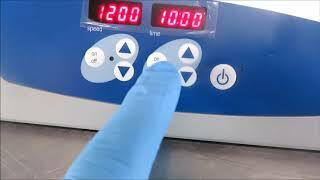 The VWR Mini Orbital Shaker is great addition to any lab looking for a variable speed shaker. The VWR orbital shaker includes an instant start and stop feature driven by a whisper quiet motor. The orbital shaker has a maximum 8lbs load capacity and can handle multiple flasks, or microplates at once. The rubber mat included with the VWR Mini Orbital allows for your samples to safely agitate under high speeds. The VWR Mini Shaker comes with built-in digital display and timer. Preset timer an easily walk-away while your samplers agitate with this reliable orbital shaker from VWR International. VWR Digital Mini Orbital Shaker has been tested and reached its max speed without isssue. All of our lab equipment comes backed with our standard warranty. Should you have any questions please don't hesitate to contact us.